The following videos are also available on the Princeton Theological Seminary Library YouTube Channel. A brief introduction to basic searching in Summon, a library search engine that includes records for books, articles, conference proceedings, theses and dissertations, videos, music, images, manuscripts, maps, and more. A brief introduction to advanced searching in Summon, a library search engine that includes records for books, articles, conference proceedings, theses and dissertations, videos, music, images, manuscripts, maps, and more. Another example of Summon's Advanced Search option. 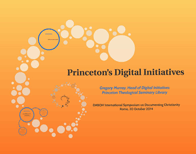 A brief presentation about the Princeton Theological Seminary Library's flagship digital project. "[T]he Theological Commons represents a blending of the aims and methods of mass digitization with the informed curation and accurate resource description that are the hallmarks of librarianship...[working] to achieve a balance that maximizes the reach and usefulness of these digital resources for research and ministry." Dr. Karlfried Froehlich, Benjamin B. Warfield Professor of Ecclesiastical History Emeritus, offers a tribute to Princeton Theological Seminary Library in a lecture given during Theological Libraries Month, October 2013. A growing number of audio and video recordings from the Princeton Theological Seminary Media Archive are available in the Theological Commons.